The Bucks are in Los Angeles tonight to play the tanking Clippers (25-43), the first of a three game road trip that will then take them to Sacramento and Denver, their final road game of the season against a Western Conference opponent. Those are the facts as I know them. Now it’s time for the fun. A Clippers game is one of those rare opportunities to explore NBA weirdness. You never know who’s on the Clippers roster, and just when you think you do, half the roster arrives at the gym in crutches to ask for a trade. I couldn’t tell you right now how they’re playing, who sits and who starts, whether MU gunner Steve Novak is still raining three’s on the opposition or whether or not the Bucks ought to be concerned about this game. I have a Chris Kaman photo. The rest is guesswork. I heard somewhere that the Clippers fired coach Mike Dunleavy, Big Dog’s first coach with the Bucks. I’ve always liked Dunleavy, who, when he was an assistant for Del Harris, suited up and played when the roster got thin. And he had a sense of humor. He was GM and coach during those win-starved “development” years, and brought Alton Lister back in 1994 because he thought it would make the fans happy to see “The Big Project” again. He was right. Dunleavy in 1995 brought Terry Cummings back for a spin, too, and that was cool, despite the 57 losses. I also heard somewhere that Marcus Camby is now a Trailblazer, and that Portland thinks maybe they can make a title run this year. Camby’s still a dedicated defender and rebounder but Camby is a guarantee that the Blazers will not win a title. Ask Patrick Ewing. The upshot is that there is somebody named Outlaw on the Clippers roster now, but I don’t think it’s Bo Outlaw from those post-Shaq Orlando Magic teams. Former Buck Steve Blake may be a Clipper, too, but whether or not Jamal Magliore was part of the deal I can’t be sure. Chris Kaman is still a Clipper and by now he should have some sort of nickname. He’s been there since 2003. He’s also a guy I’ve never liked as an NBA center. In fact, I refused to list him on the inaugural Bob Boozer Jinx center rankings on grounds that I could not make a “Top Ten NBA Centers” list with Kaman on it. He’s lumbering, he’s awkward, he’s ridiculous looking, he misses more bunnies than a big man has a right to. I hold him responsible for my man Sam “I Am” Cassell‘s failure to lead the Clippers past the Suns in the 2006 playoffs. There were times during his career that Andrew Bogut on a bad day reminded me a little of Kaman, but I didn’t blame Bogut. I blamed Chris Kaman. Kaman used to have the worst hair in the NBA (and that’s saying something) — but at least he had the guts to play with the game with a few strands of flyaway hair, and that was something to be said for Kaman. Now that he’s cut his hair, I can’t think of anything good to say about Chris Kaman. Except that he’s averaging 18.8 ppg and 9.1 boards on a bad team, all the while refusing to jump. He’s as big as Bogut and a lot wider but Kaman and Bogut haven’t gone head-to-head since Feb. 11, 2008, in Milwaukee. That didn’t go well for the Bucks or AB. While Kaman only had 7 pts, he grabbed 15 boards and bodied Bogut into a 4-16 shooting night. Bogues was good on the glass with 12 but Al Thornton killed Yi and Charlie V for 25 pts. (Check that — no, it really does say that Bogut got 16 shots two years ago). It was the night Michael Redd decided he was going to finally make coach Larry Krystkowiak happy by sharing the ball, and he did, refusing to shoot in the first half. Redd racked up a career high 11 assists and Mo was all too happy to take the shots (he was 12-20 from the floor). The Bucks appeared to be outplaying them all night, but … somehow we managed to lose to a 16-32 Clippers team at the BC. It did make for a weird-looking boxscore … those were the days. 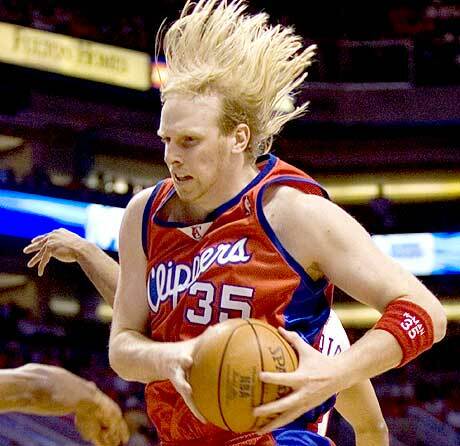 And Chris Kaman still had his hair. This entry was posted in The Jinx and tagged Alton Lister, Andrew Bogut, Chris Kaman, Jamal Magliore, Larry Krystkowiak, Los Angeles Clippers, Marcus Camby, Michael Redd, Mike Dunleavy, Milwaukee Bucks, Sam Cassell, Steve Blake, Steve Novak, Terry Cummings on March 17, 2010 by J.D. Mo.